As it became possible to find out during the study of the cost of electronics in Ukraine, the flagship phone of the top level in the face of Xiaomi Mi 8 has fallen extremely sharply in price, because now you can buy it for 9000 hryvnia, although recently it was sold for 12 to 13 years thousand hryvnias, much more expensive. He fell in price due to strong competition, as well as due to the fact that the company-manufacturer has reduced its value all over the world, thus wishing to increase the demand, which certainly did it successfully. Black, white, blue and golden colors are available to choose from, with all of which the mobile device looks very attractive. For a very attractive amount of money, the buyer gets a really great smartphone running on the basis of the MIUI 10 firmware, based on Android 9.0 Pie, that is, on the latest of all operating systems released by Google. In addition to the freshest software, this phone boasts a 6.21-inch Super AMOLED display with a resolution of 2248 by 1080 pixels (FHD +). 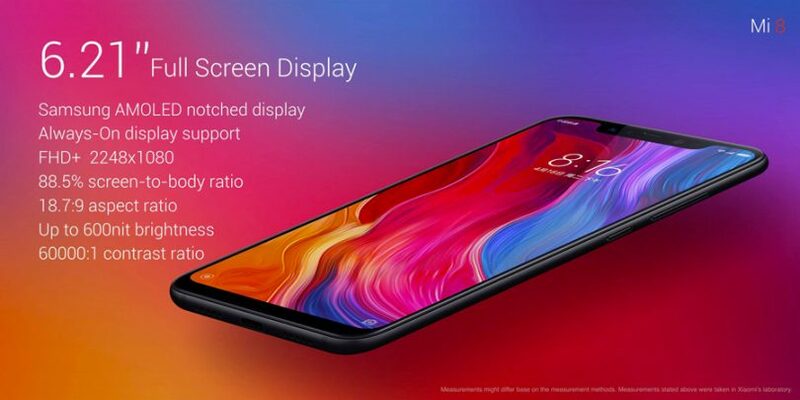 Otherwise, Xiaomi Mi 8 has an eight-core Qualcomm Snapdragon 845 processor running at 2.8 GHz, Adreno 630 graphics, an X20 LTE modem with support for up to 1.2 Gbps, dual core (12MP + 12Mp) and 20MP front-facing cameras, a USB Type-C connector, a Corning Gorilla Glass 5 safety glass, and a 3400 mAh battery with Quick Charge 4.0+ quick charge. The dimensions of the smartphone case are 154.9 x 74.8 x 7.6 mm, and weighs 175 grams. You can buy the smartphone via the link .